At, 11%, 75 IBUs, brewed with pale, crystal, cara, chocolate and special B malts, and seasoned with nugget, fuggles, and golding hops, the Howe Sound Woolly Bugger barley wine is a highly complex, highly refined, must-see-for-yourself beer. It is thick, with bits of sediment/pebbles floating in the bottle; not to worry, decant it finely and enjoy the character it bestows. While not a huge fan of barley wine, and having not yet tasted one that really floats my boat, the Howe Sound Woolly Bugger blew me away. The beer is bursting with flavour, both on the nose and the palate; each individual sensation is distinct, yet well integrated, and highly pronounced. On the nose, there is a rich chocolate caramel sweetness that mingles with delicate hops — particularly the fuggles (reminds me of the Anchor Christmas Ale) — and a red wine-like acidity. The alcohol presents itself with a slightly citrus sourness that deftly complements the rich sweetness of the malts. The beer is profoundly sweet, but the malty sweetness is balanced by robust hops, and enough IBUs to instill a crisp finish. At 11%, it is slightly heavy and the malt sticks to the sides of your cheeks. Since the flavours are so well endowed, you really can’t drink too much; one is perfect. This is currently the best barley wine I have tried, though I never got a chance to taste Driftwood’s highly regarded ‘Old Cellar Dweller’. Rogue, however, makes a close second. 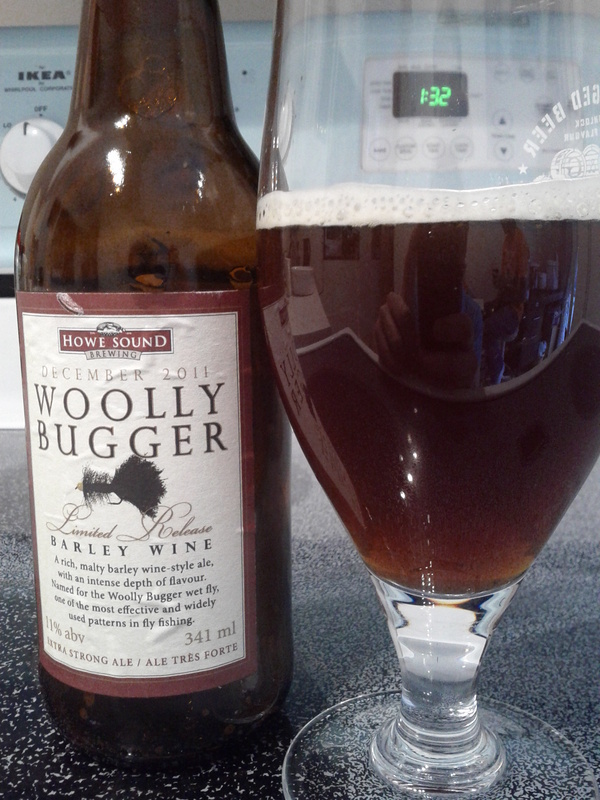 Without a doubt, Howe Sound Brewing’s Woolly Bugger is one of the best barley wines I’ve had to date. With an 11% alcohol content and 75 IBU’s, this beer packs a pleasant and complex punch with the wide variety of malts and hops contained in the bottle. And while generally I’m not a huge fan of beers with fuggles hops (such as the Innis and Gunn Canada Day 2011 release), the mix of fuggles with other varieties was a nice counter balance to the malts. This beer had an ability to constantly keep your palate guessing as to the flavours and an ability to leave you wanting more; a feeling some barley wines lack. On the nose, the malty sweetness is quite prevalent as in any barley wine, yet the fuggles hops really cut through to my sense of smell. Surprisingly hoppy, the floral aroma is very inviting when mixed with the malty sweetness. The body is thicker than I anticipated, but it still allows for easy drinking. In terms of taste – having been sitting in my cellar aging for over six months – the tones of chocolate were noticeable through the sweetness. As well, the hops was adding to the rich complexity that Kamran and I both enjoyed. The finish had a flash of bitterness on the tongue with a lingering sweetness and a chocolate taste that seemed to stick to the cheeks and back of the tongue. It even had the similarity of an alcohol taste like a cognac from what we could derive. This beer is best enjoyed alone and at a cool temperature, and is one of the only barley wines I could recommend as a session beer if the occasion arose seeing as I could easily have a few in a night. So if you happen across this beer in a store, buy it and enjoy! This is a unique beer, if there ever was one. 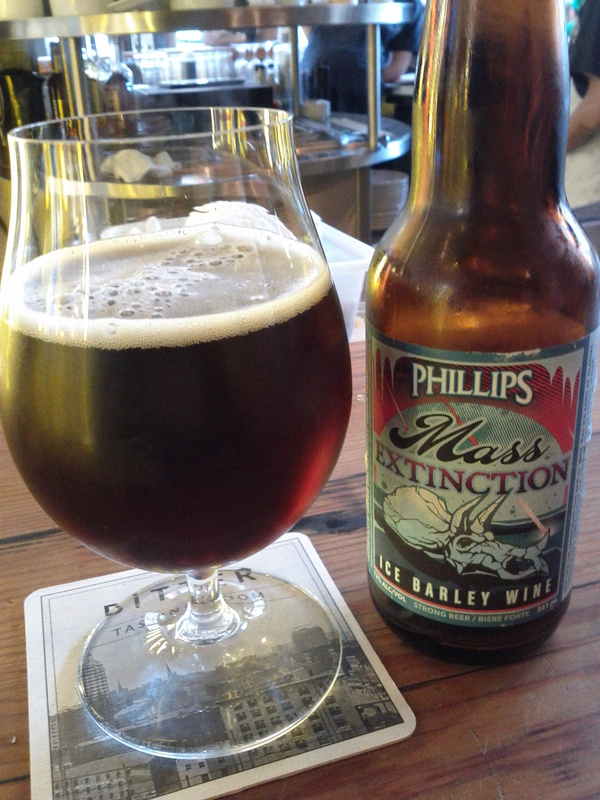 Phillips Mass Extinction ice barley wine “underwent a crystalline phase which distilled the remaining liquid into a naturally sweetened nectar of caramel”. In other words, this beer was literally frozen, like the late-harvested grapes used for icewine, in order to concentrate the sugars, and release a high percentage (12%), yet still highly sweet beverage. While Phillips Mass Extinction is flavourful, powerful, and unique, it is quite one-dimensional; it is plainly sweet and malty. Similar to their Trainwreck, the flavours are quite subdued, or contained. The beer certainly needs some air to run through it to open it up. 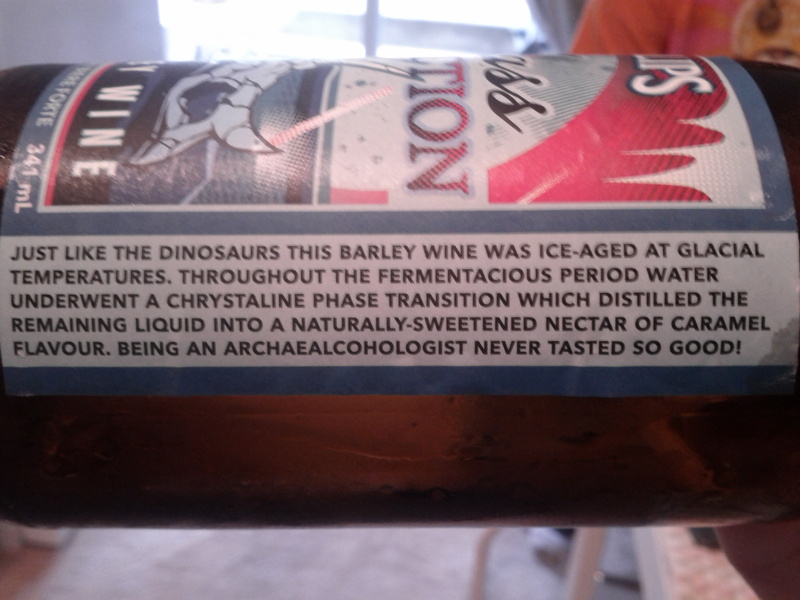 Since it is kept in a frozen state for a relatively long period of time, I suppose they use lager or pilsner yeast. The result is a slightly metallic and alcohol filled nose — all that can really be sensed under the malty sweetness. While it is quite complex, the potential for pleasant flavours is all but restricted. The malt and alcohol overpowers the character of the sweetness; I could not even taste the caramel that Phillips claims on the bottle is prominent. That said, despite the lack of flavour, the sweetness itself, if tasted in just the right way, gives a beautiful sensation on the tip of one’s tongue. For this reason alone, I can enjoy the beer. While the body is kind of heavy, it’s not quite as bogging-down as some other barley wines, such as the trainwreck. However, the alcohol at 12% is certainly noticeable. The sweetness kills the alcohol on the finish, making it not so harsh to go down. There is a slight sickly sweetness that sticks to your gums; at first it is quite pleasant, but the lingering of it is not appreciated. While Phillips is my favourite Vancouver Craft brewery, I have simply been underwhelmed by their barley wine. I’ve had this beer on a couple of occasions now, and I have to admit… when compared to other barley wines this does not appeal to me at all. I’d much prefer the other Phillips barley wine, Trainwreck, over this for a few reasons. First it’s sickly sweet for my taste-buds. Secondly, I am unable to determine its complexity or if it really does taste plain. Lastly, again it is just too damn sweet. Now I understand that this beer would appeal to some sections of the population, but most of those who do like it must have lived on candy through their childhood and pound back sugar with their coffee and cream – any chance I can work in a lyric from the Beastie Boys is a good day! I appreciate the effort that went into making this beer. It has a very cool process of creation which takes some serious dedication, but the quality just wasn’t here for this particular brew. As for the review, the nose is super sweet like a caramel with a metallic note to it. I sometimes get the same smell from lagers and pilsners so perhaps it’s the variety of yeast used. The body is a medium heaviness, with nice colouring and beading of carbonation. The taste is a caramel rich sweet, with perhaps notes of roasted chocolate malt hidden away. The finish is lingering malt that haunts your palate for an unwanted amount of time. It took some water and a few tic tacs to get a more pleasant taste back into my mouth. While I do really like Phillips and their products, this did shake my faith in them. If someone were to ask me if I could recommend it, I probably would say don’t waste your time. I know I’m going to stick with the regular Phillips beers from now on. A seasonal by Phillips brewery, this 10% barley wine packs a punch. For those unfamiliar, a barley wine has nothing to do with wine, except that it has a strong alcohol percentage — likening the percentage of wine. It is still, of course, fermented from grain — barley — rather than grapes, and, though many other styles of beer, such as a Russian Imperial Stout, may boast a high alcohol percentage, barley wines are a distinctly unique class of ale. They tend to be complex, earthy, fruity, a touch sour — winelike — and malty. I must admit, despite my current familiarity and experience with complex beers, such as barley wines and lambics, the Trainwreck, tasted about a half of a year ago, broke my barley wine cherry. Because of this, my initial impression of the beer was certainly flawed. I have since seen the err of my ways. The complexity of a barley wine surprised me, and I gave the beer extra credit simply for its uniqueness. Fact is, it’s really not unique, and after trying several other barley wines, the initially strong impression once held in my mind — of the Trainwreck — faded away. The nose has a slight florality that is masked by delicate hops, lots of complex malts, and a slightly sour, wine-like — reminds me of a 1989 Chateaux Musar I once tasted — aroma. It’s quite heavy, and, therefore, a sipping beer; however, you couldn’t tell it was 10%. I certainly couldn’t drink more than one bomber bottle, though. Like with other complex beers, familiarity causes the flavours to grow on you, and I found myself enjoying it more as I continued drinking it. I think it was better warm, too. That said, the flavours are quite subtle, and nothing jumps out at you. In all its complexity, the flavours are muddled together, sending rather incoherent sensations on the palate. This results in what I find the weakest aspect of the beer: the finish. It lingers in an awkward, bitter-sour way. Still, a relatively enjoyable beer overall. Now when it comes to barley wine I’m the first to admit, probably not a beer choice you’ll want to session all night long unless you find one that blows you away, and while the Phillips Trainwreck isn’t exactly one I’d recommend for a night session it does grow on you to the point where one or two of the 750ml bottles are a nice way to spend an evening with company. Certainly a beer that improves as you drink it, whether it be to the increase in flavours as it warms slowly or that your palate adjusts, this brew is likely my favourite of the two Phillips barley wines we’ve tried. On the nose it has all the tell-tale signs of barley wine in regards to sweetness with faint hops, and the body is fairly typical as well. The beer is savoury, smooth, and heavier compared to most barley wines, but certainly no liquid meal like some people find with stouts. The flavour is caramel tones, with a slight hops tucked away. The finish is smooth with a slight bitterness/tang after you swallow it, with a lingering sweetness that you’d expect. While I’ve certainly had better barley wines I could see myself ordering this at a pub or getting another bottle at the store for a night’s one-off beer. Not a wow-factor contender overall though, but the scoring is reflective on something above average at least.